Hessie recalls that her Greataunt Ann had a pithy sense of humour. On a walk in the park with her dog, she was admonished by a park-keeper for not keeping her dog an a lead. "It says there on the sign, 'Dogs to kept on a leash !' ". "Oh, what a shame, the poor thing can't read." Greataunt Ann always took a small pair of scissors with her, when she visited parks and stately homes. She would take cuttings of plants that appealed to her. "That's larceny ! ", her companions would say. "Yes, but at least we have the cuttings !" 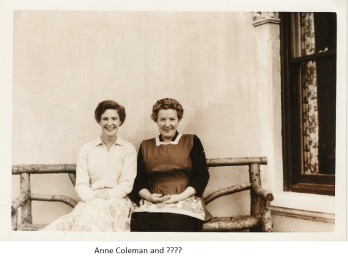 One of these ladies is Anne Coleman, but which one ? And who is the other one ?